Summer is unofficially here and I couldn't be happier! Yes it was a mild blip of a winter but there's something about a warm, sunny day that puts me in an amazing mood. My only gripe about the warm temperatures is the general state of my makeup after a chunk of time in the sun. It either slides right off or smears down my face. Neither looks too pretty. My favorite remedy for this ailment involves Urban Decay's Eyeshadow Primer Potion. 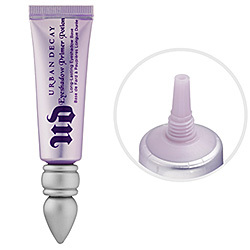 I add a drop on each eyelid and even mix it with my under eye concealer for an even and smooth application. My shadow and liner sits firmly on and doesn't want to run off anywhere. Raccoon eyes no longer! Be sure to grab a tube and throw it in your bag this summer. It's the perfect tool to touch up your makeup after work or after a few hours out and about. Loving the latest nail creations by my brilliant cousin Julia. These neon patterns have a festive Atari-like feel to them. Neon nails are so fun for the summer and experimenting with fun patterns is a great way to express yourself. This girl is a nail-genius.